At the more affordable end of the audio market place there are not too many active speakers available. I know that active Bluetooth speakers are becoming widely available but they don't count in my opinion as they largely do not meet our expectations on sound quality. 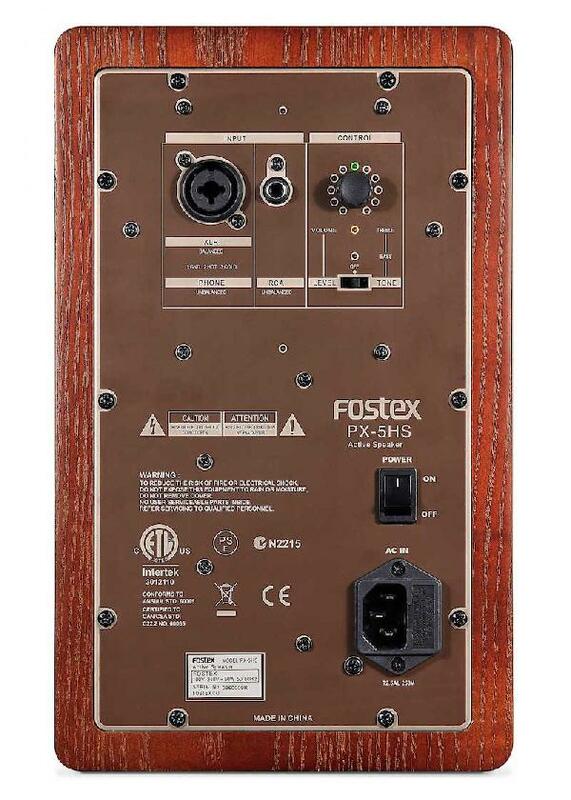 Here we have the "Fostex PX-5HS active HiFi" speakers that are definitely worth a listen. With a 5.2 inch aramid fiber woofer plus 1 inch soft dome tweeter and 35W amplifiers for the bass and 18W for the treble, both class D I assume. As you can see from the rear view above the PX-5HS supports both balanced and single ended inputs. To the right of the inputs you have a simple set of controls for setting the volume and tone. Flick the switch to the left and the rotary control sets the volume, to me it is more a sensitivity control and in my setup I set it to maximum. With the switch to the right you can adjust the bass and treble levels. When first selected the default is treble, just push the rotary and the speaker switches to bass setting. If you put the switch in the middle the rotary control is disabled so you cannot inadvertently change the settings. The level/tone switch has one more less obvious feature, if you leave it in either level or tone position, after about four hours of no input the speaker will switch into stand-by mode. I did not use the stand-by mode as I could never get it to come to life again no matter what the volume setting is on the pre-amp. To start with I setup the PX-5HS on my regular speaker stands and connected in balanced mode to my MFA Classic pre-amp using 10m cables. Whilst this worked, the volume on the MFA had to be almost full up to get a decent volume and even then the sound felt a little lacking. As I was using long balanced cables I expect the MFA was not happy with that length of cable. Long interconnects really need an active pre-amp in my experience. I therefore switched to my YS Audio valve pre-amp using the balanced outputs and the Fostexs seemed to come alive. Active speakers are no different to passives, they need careful positioning and matching with an appropriate source. The tone controls are certainly effective, you can apply bass and treble boost/cut and tune the sound to your taste, effective, though not something I like doing, I prefer to keep the response flat if possible. The case, as you can see, is a simple and nice looking wood grain vinyl wrap with rounded corners and a curvaceous, moulded front panel. There are no covers for the drivers, what you see is what get, so care is required when removing from the packaging and in general handling. I gave the PX-5HS 50+ hours of use to burn in before serious listening and during that time the speakers definitely settled down. The sound relaxed and opened up giving the sound more air and revealing more detail. After the initial burn in period, the sound continued to improve so do give these speakers adequate time to settle in before jumping to any conclusions. I also found that positioning was important to get the best sound stage, it only took a few degrees of toe in adjustment and the sound stage could be offset to one side or lacking in focus. Once tuned in the sound stage became focused and much more 3 dimensional. I have never used a commercially available active speaker before, although I have dabbled a bit using a DSP as a crossover with some drivers chosen by guess work. In my attempts to get a working active setup I soon realised this is not as simple as you might think. 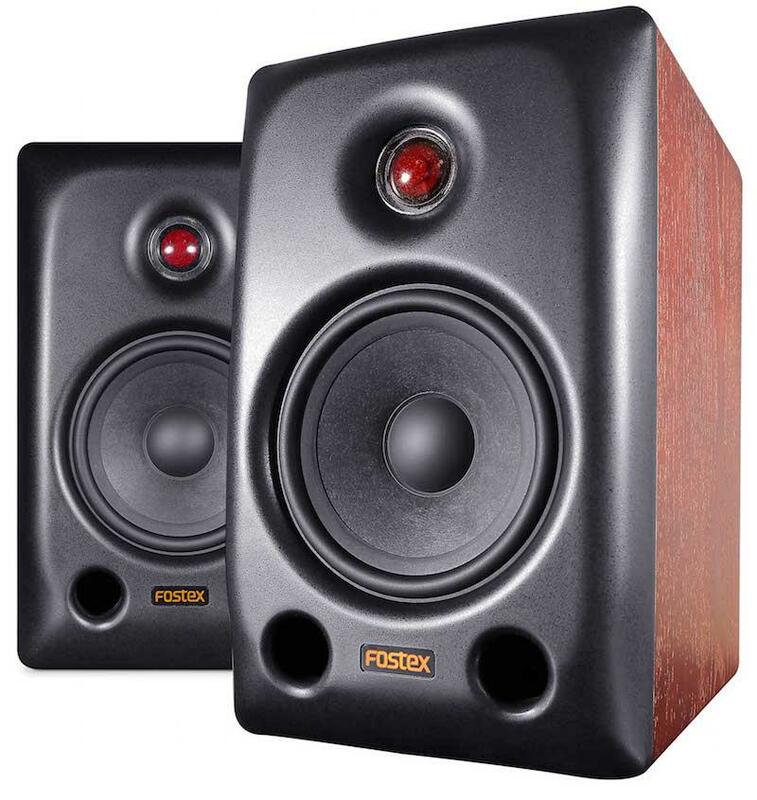 Fostex have done a very good job of delivering a nice pair of active speakers that are easy to setup and use. As I have described earlier, these speakers do need a considerable run in period. Even after all the time I have had them they still appear to be improving with the sound opening up and the bass reaching lower. I remember a review of the venerable LS3/5a back in the 1980s where a distinguished reviewer, still in circulation today, said that "the LS3/5a was like listening through a smaller window". The window is wide open and clear, you just cannot see (hear) as much of what is in the view. I am not pretending the PX-5HS is an LS3/5a replacement, just that the same analogy applies. The bass is nicely formed and enjoyable, just not as deep as other, much more expensive speakers. The same applies at the other end of the audio spectrum and in between the resulting sound is clean, well timed and a very enjoyable experience. As I write I am listening to Jesse Cook album "Vertigo", a modern take on Flamenco. This album depends on a system that can deliver music at a fast pace and the PX-5HS certainly keeps up with the music. Perhaps not as fast paced as some systems I have heard, even so the presentation gets my foot tapping. Changing artist and style to some vocal jazz from Diana Krall you get a good measure of vocal texture and inflection. The sound stage is well presented with height and stage depth behind the speakers. The sound does not jump out at you and sit in your lap like some speakers manage, it is like sitting a couple of rows back from the front at a good concert. Turning to some music that is more delicate and atmospheric, the Tallis Scholars and the Allegri Miserere, the PX-5HS resolves the ambience and deep detail in the recording magnificently, it is as though these speakers were made for this piece of music. Upping the volume and moving forward in time to Led Zeppelin and "Whole lotta love" you do begin to stretch the PX-5HS to the limit. In the middle section with all the percussion you get the details very nicely presented, it is when the band wind themselves up to a crescendo that you feel the speakers are running out of puff. It is not surprising when you consider the available power and size of drivers. Even with this limitation, I still enjoyed the performance, some speakers I find struggle with the material. The PX-5HS may seem expensive at £324.50 each but don't forget you do receive a power supply, digital crossover, and two power amplifiers in each speaker. Using a DAC with volume control (Audiolab M-DAC) and balanced output plus a computer with your music stored on a network drive you will get a really nice system. With care, you could achieve this setup for less than £1500. If you want to use single ended connections a Fostex HP-A4 DAC and some quality phono cables should make a nice combination. As a digital source, I use a simple desktop PC running Audiophile Linux, but a Windows PC or MAC with JRiver is also a good choice. I won't enter the debate over the best computer setup, there is plenty of detail out on the internet. If you work within the limitations of these speakers you can achieve a very good sound with a very simple setup. If your room is not too large or you are going to use them for near field monitoring then you have a good starting point. Pick some suitable stands that are rigid and give the PX-5HS a good grounding then they will work a their best. Once setup and configured, the system with the Fostex PX-5HS delivers a very enjoyable performance with adequate detail and good timing. At the same time as I received the Fostex speakers from SCV they also supplied a set of IsoAcoustics Aperta Stands. These are isolation mounts for the Fostex that fit under the speakers and on top of the stands or shelf. These are a relatively low cost alternative to the isolation devices from Townsend Audio. In a few weeks I will write a piece on using the IsoAcoustics Aperta Stands with the Fostex and my regular stand mount speakers.